The challenge for doctoral researchers: communicate your research in just 180 seconds. The annual Three Minute Thesis competition challenges competitors to be clear, compelling and, above all, concise as they deliver a spoken presentation on their research topic in a mere 180 seconds. Bristol has a very impressive track record at the UK level. 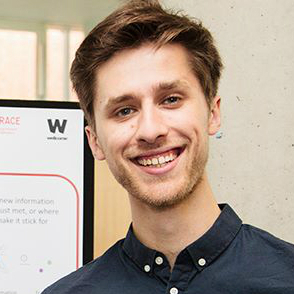 In 2017, Alfie Wearn, who delivered a presentation on Alzheimer’s research during May’s Research without Borders event, made it all the way to the national final. This year's semi-final will take place from 1–4pm on Tuesday 30 April in the Reception Room of the Wills Memorial Building. enjoy a selection of free refreshments. Intersted in joining us? Book your free ticket on Eventbrite. The fast-paced finale of our 2018 competition took place in Colston Hall on Wednesday 9 May as part of the Research without Borders festival. Watch all eight presentations from the final on YouTube. Make sure you don't miss our 3MT semi-final on 30 April. Reserve your free place now on EventBrite. I urge everyone to have a go at the 3MT and take part in Research without Borders. You get a snapshot of all the research at the University that you might never even have realised is happening...Lifting your head above the water every now and again to see what is going on around you is a habit we should all get into – and what better way than these two fantastic celebrations of research at the University of Bristol. Find out more about its origins on the Three Minute Thesis website.